I’m a Doctor Who fan from way back. Way back to the late 70’s, Tom Baker era. 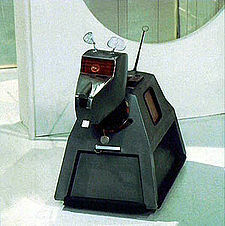 One of my favorite characters, back when I began watching, was K9, the metal dog. In fact, I had a button which said “K9 Has Metal Fleas.” Obviously. Recently, as of last spring, I went backwards in time, in my very own Hulu Prime TARDIS, and watched all of the available Doctor Whos, from beginning to end. I fell in love all over again. And when I brushed up on the latest season a couple of weeks ago, it got me to thinking. So which treats would K9 like? He’s a good dog, but not an energetic one. More of a Basset Hound than an Australian Shepherd. Sniffs out danger with that nose. K9 is even low and wide-bodied like a Basset. But without the floppy ears. So I came up with a list of 5 treats which Doctor Who’s dog would like, if K9 could actually consume treats. Pig Ear – fine tuning K9’s radar ears requires some radar ears from swine, yes? I’d love to hear from fellow Whovians. Which is your favorite Doctor? Do you like the most recent regenerations? Which of those is your favorite? Your least favorite of all? My least favorite tends to make people angry. I love David Tennant as an actor, but not as the Doctor. He plays it all wrong. But it’s hard to choose a favorite. I guess I’ll have to stand by my very first love, Tom Baker. A fast second is Matt Smith. I obviously favor Tom Baker. My daughter made this scarf for me for Christmas one year. And don’t forget to enter our Hoof giveaway! It ends this weekend, and you can tweet daily for extra entries! Get on it, people! Give your dog a treat, while you’re at it. And I’ll just be here, spreading the good chews.